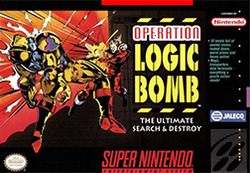 Operation Logic Bomb for Super Nintendo features Scientists that have mastered subspace particle transfers. This allows objects to be dematerialized, beamed instantly to another location, and rematerialized. The only limitation in early studies was distance. However, long-range tests were about to begin. Unfortunately, contact with the research lab has been cut off. Agent Logan, who has been fitted with devices that augment his strength, reflexes, and analytical abilities, must infiltrate the lab and rescue the scientists in Operation Logic Bomb.